Traditionally, municipal solid waste collection and disposal services have been financed through property taxes or by fixed annual fees charged to households. At the same time, households are charged according to their rate of use for other utilities such as water and sewer service or electricity. As a result, residents often mistakenly perceive that solid waste services are free because of the separation between cost of services and how they pay for them. Citizens have little direct financial incentive to reduce the amount of waste they produce. Also, because each household is generally charged the same amount, small generators subsidize garbage services for those who throw away more. Many local governments are adopting Pay-As-You-Throw (PAYT) programs for both curbside and drop-off collection systems. With PAYT, also known as “variable rate financing” or “unit pricing,” customers are charged by weight, by volume, or by a combination of the two per unit of garbage disposed. Market-based approaches such as these are proving to be important tools for dealing with environmental issues. 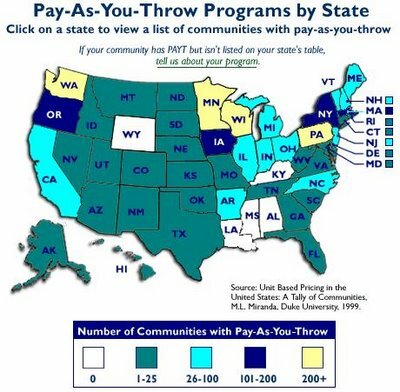 With only a dozen PAYT programs in the late 1980s, the United States now has more than 4,000 communities with such programs.1 PAYT programs have been mandated in both Minnesota and Wisconsin. More than 30 North Carolina communities are using or are part of larger (county-run) PAYT programs. • Economic Incentives to Reduce – PAYT creates a direct link between waste disposal and cost resulting in a true economic incentive to reduce the amount of waste generated and recycle as much as possible. • Reduced Solid Waste Tonnage – In most communities, the realization of costs associated with waste management results in a decreased tonnage of waste to be disposed. This decrease is attributable to both source reduction and increased recycling. A reduction in the tonnage of waste disposed generally results in savings from reduced tipping fees. • Increased Recycling – The easiest way system users can save money is through increasing recycling. Increases will vary in size based on public education programs and the level of services available. Communities that receive revenues from recycling will see an increase in recycling revenues, however, these revenue increases may be quickly off-set by increased recycling hauling costs.